Cavalier County, North Dakota, was home to approximately 540 Mennonites in 1950. It is located in the northeastern part of the state. The Mennonites, though scattered at that time, were located chiefly in the southwestern part of the county. Approximately 75 per cent were members of the General Conference Mennonite Church, 15 per cent were Mennonite Brethren, and 10 per cent were Church of God in Christ, Mennonite. The first Mennonite settlers perhaps arrived in the county in the early 1880s. In 1950 there were in the county five Mennonite churches and the Bethany Bible Academy, which was located in Munich. Ortmann, Hellmuth. "Cavalier County (North Dakota, USA)." Global Anabaptist Mennonite Encyclopedia Online. 1953. Web. 20 Apr 2019. http://gameo.org/index.php?title=Cavalier_County_(North_Dakota,_USA)&oldid=91361. Ortmann, Hellmuth. (1953). Cavalier County (North Dakota, USA). Global Anabaptist Mennonite Encyclopedia Online. 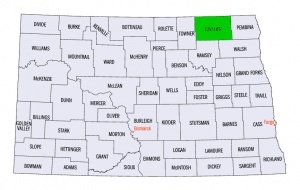 Retrieved 20 April 2019, from http://gameo.org/index.php?title=Cavalier_County_(North_Dakota,_USA)&oldid=91361. Adapted by permission of Herald Press, Harrisonburg, Virginia, from Mennonite Encyclopedia, Vol. 1, p. 537. All rights reserved. This page was last modified on 23 August 2013, at 13:57.